Hours slip by. Rain comes in waves. Sheets of water make it hard to see a hundred yards. Thunder pops and roars, sometimes distant, sometimes right overhead, shattering the sky. I don’t move. The air, the wind, the clouds, the radio, they all say the same thing, a storm is coming. A big one. Inches of water. So I picked carefully last night–high ground in a forest, good trees to string lines on, no dead limbs above. Now I sit underneath my tarp counting hours. Bugs hide in the corners for shelter. Spiders follow. I curl into a ball and try to sleep. All of us hide from the rain. Water splashes and rolls off the tarp’s edges then splatters against the ground. I pull in my arms and legs, shrinking as 49 square feet of dry land whittle down to 25. I stare at the water. Part of me wants to burst out and go, to let it soak through my clothes, to move forward, but some days are better left still, hidden away on high ground, never moving from a 7′ by 7′ square. Posted in Angle to Key WestTagged Angle to Key West, bugs, rain, shelter, weatherBookmark the permalink. Daniel: That was an impressive spring storm. 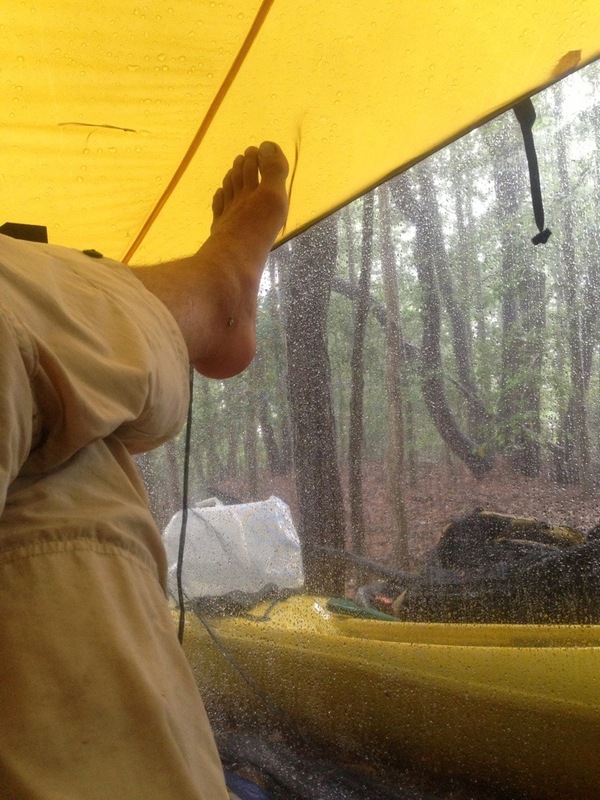 Enjoyed your post in the new Outside magazine adventure grant contest. Hope all of them go through their adventure regardless of outcome. I was surprised that out of the last five there was no “solo” entry. Voting continues until June 28th. A wise person once said, “Be careful of what you wish for ….” and our parents have told us that ever since. Glad you got such a quick response to yesterday’s post!